You must have Admin Permissions to use this function. To create a custom pick list, navigate to Pick Lists under Admin, and click Add Pick List at the top right of the page. This will open a pop-up. Enter the name and a description, if desired, and select Save. The window will close. Click Config on the line of the new pick list you have created. A side window will open up. This is where you can add and edit items for the pick list. Click on the green circle on the top right to add an item. This will open a pop-up window. Display is the name of the item that will display within the pick list. Description is an optional field to add further details about the item. Value is a secondary field that can be useful for reporting instead of working with the Display field's user-friendly text. Color can be assigned with the pick list item. If desired, one color can be used multiple times. The menu to the top right offers further customization with your pick list items. Use the pencil button after highlighting text to edit the item. Use the flag to decide what item to make the default. There can only be one default item per pick list. Use the up and down arrows to move items higher or lower in the order. Use the red X will delete a pick list item, and the green circle with a plus sign to add a new one. After you have finished creating a custom pick list, you can assign it to be used in an item. Navigate to the Item Types section under the Admin screen. 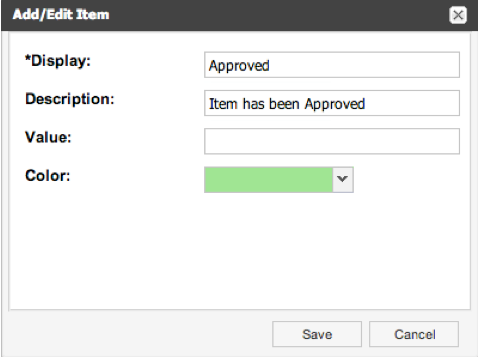 Select the item type you want to add the pick list to, and click Config. This will open a side window showing the active fields for the item. Select Add Field at the top right to open a pop-up box to add a new field. 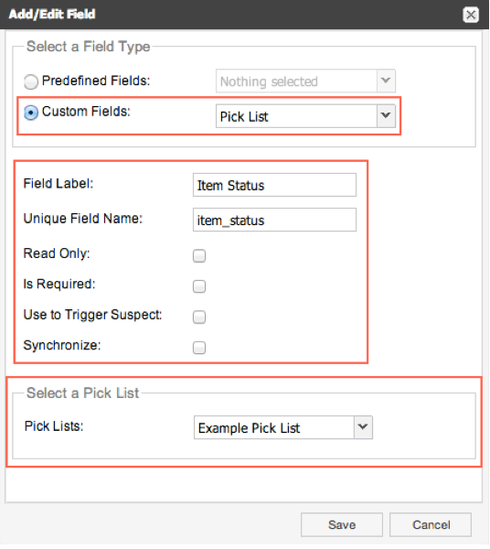 Since you are trying to add a custom pick list, select "Custom Fields" as the Field Type. From the drop down, choose Pick List. The Field Label will display the user-facing name shown, and can be different from the pick list name. Hitting "Tab" after entering the Field Label will automatically fill the Unique Field Name. Checking Read Only will prevent users from being able to edit the pick list, with the exception of syncs and APIs. Checking Required will make the field required when creating a new item type, or when importing an item through Word, Excel, the API, or any integration sync. Use to Trigger Suspect will create a suspect link between relationships when the field has been edited. Synchronize will allow the field to be synchronized across the organization. Lastly, find the field list you created earlier and select it. You have now created a new field in an item with a custom pick list. is it possible for non admin users to see not only the display value but also the description when selecting a value from the pick list? Hi Senthil! Great question. As you have determined there isn't a way to bulk import values for a pick list item via the GUI. We would recommend doing this via the API. More on SOAP can be found in the SOAP category of the community, including an article about updating pick lists via the API. Is there anyway to bulk import on pick list item? Say we have around 100 pick list items to be added in a drop down list. will it possible to a bulk import ? or can we achieve this at backend by using any SQL query insert?? Andrew, you asked a good question. Kristina has given you the perfect answer. :-) In addition, when an org admin deletes a picklist value, there will be an opportunity of mapping it to a different value by selecting an existing value for the "replacement lookup." Great question. As long as you are editing the display values of the pick list (Admin > Pick Lists > [select pick list] > Config > select Pencil icon > edit *Display), the values will be updated in the affected items. What are the impacts on the existing items when we change values of the pick list. Let say that the original pick list has value 1, 2, 3, 4. There are existing values associated with these. We now want to add a description next to those original values to make 1 - High, 2 - Medium, 3 - Minor, 4 - None. What are the impacts to the existing values that have associated with 1, 2, 3, and 4.